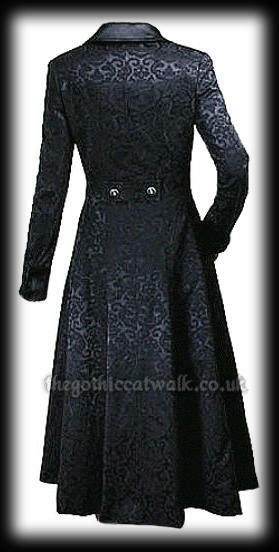 A beautiful and elegant mid-length gothic coat made from good quality black damask fabric. 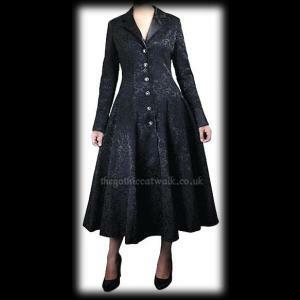 The coat is fitted at the waist with a full flared lower section. 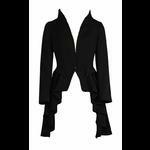 The collar, revere and turn-back cuffs are made from black sateen with a decorative button on each cuff. 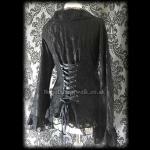 There are six decorative buttons fastening at the front. 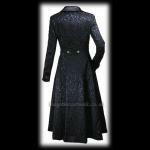 The back of the coat has a band at the waist finished with two buttons. 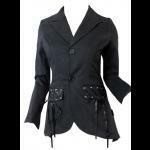 Concealed pockets on each side seam. Fully lined. Bust: 32" Waist: 28" Length: 46" Sleeve length from underarm: 18"
Bust: 34" Waist: 30" Length: 47" Sleeve length from underarm: 18"
Bust: 36" Waist: 32" Length: 48" Sleeve length from underarm: 18"
Bust: 38" Waist: 34" Length: 48" Sleeve length from underarm: 19"
Bust: 40" Waist: 36" Length: 48" Sleeve length from underarm: 19"
Bust: 42" Waist: 37" Length: 49" Sleeve length from underarm: 20"
This coat is absolutely gorgeous and the fabric has a luxurious look & hangs beautifully. 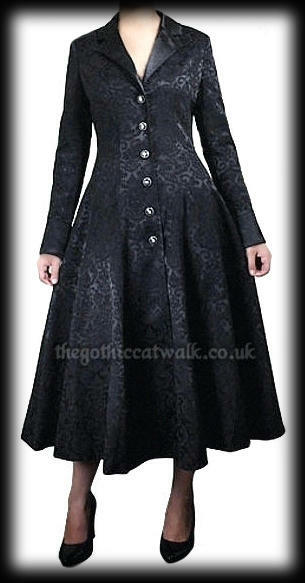 I've worn it with everything from 50's style petticoat skirts to Victorian-esque floor-length gowns and it looks equally as lovely with all of them!